Why this feature isn’t available by default in Windows is a mystery to me. Ever since reading this post I wanted to use this awesome piece of software, but all my systems were already up-to-date and never needed it. As of this week, I’ve started working on a new project. Therefore, a new virtual machine had to be installed and configured. An awesome excuse to start using Chocolatey! With Chocolatey you can install all kinds of software, just by typing a command in your Command Prompt or PowerShell window. It will automatically download and install the software for you. The only thing you need to do is wait for the command to finish. 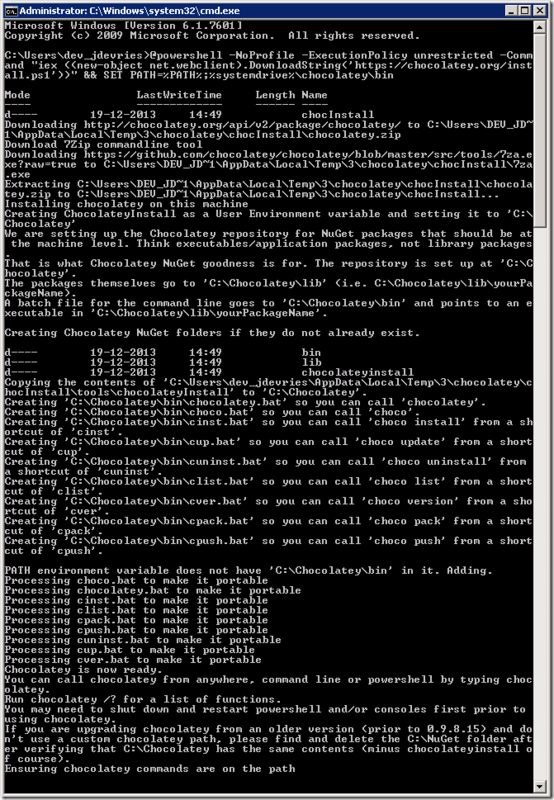 Installing Chocolatey is easy also, just open up a command prompt window and copy-paste the install text from the homepage to your window. After the installation has finished, the window will look something like this. Now you are ready for the real fun, installing software via scipting! Visual Studio 2010 was already installed on my development machine, so I had to think of something else which is necessary. My choice was ReSharper. If you are unfamiliar with the Chocolatey commands for installing this software, just head up to the website, search for the software in the search box and everything is explained as the search results show the exact commands you need to install the software. When finished, the gods are thanked appropriately and the software is good to go. Of course, you don’t want to install all your development software manually via the prompt window. Therefore, it’s also possible to script it! I’ve created a small Install.ps1 and placed it in a DropBox folder, so I can use it everywhere. The contents look like this. There’s probably much more to Chocolatey, but this what I’ve figured out so far. 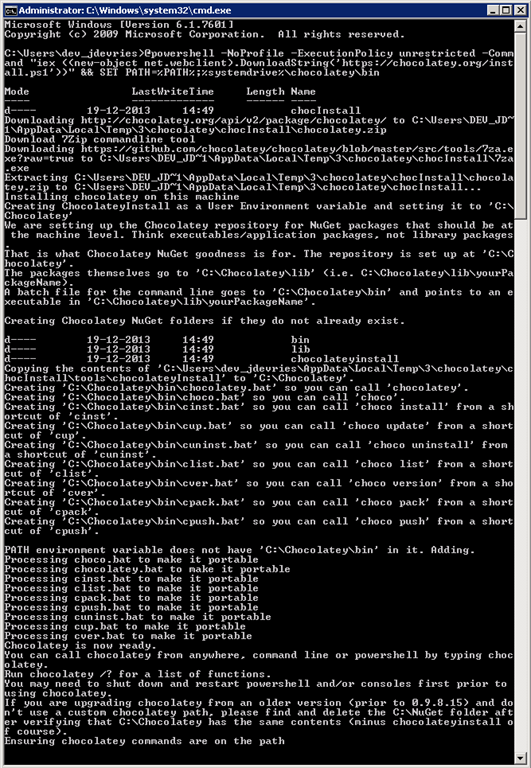 It’s too bad not all software is supported for Chocolatey yet, but it’s a great start. Most software you need is already in the repository and you can add new packages yourself on the website.